In the world of K-pop, alcohol hides behind a closed door, waiting to strike an idol to her knees in controversy. The bizarre part is that scandals that arise out of alcohol are seemingly random: drinking solo is gradually becoming more socially accepted, while celebrity Instagram posts with alcohol regularly incite controversy. This inconsistent vitriol demonstrates the complexity of the relationship between female idols and alcohol. Internationally, South Korea has developed a notorious relationship with alcohol. In fact, they drink twice as much liquor as Russians and have the most alcoholics. According to Chosun Ilbo, almost 6 million Koreans drink alcohol every day to the tune of 9.52 million bottles of beer and 8.96 million bottles of soju per day. Drinking is a cultural thing: it’s something you do with coworkers and friends — a bonding exercise and social activity that can act as a way for people to get ahead in the workforce. Coworkers often go out for BBQ every month, and sometimes more frequently in gatherings known as hoesik. While a chance for coworkers to bond, there is also regularly intense peer pressure from elders to drink and saying no is rarely an option. Despite being the premier form of team-building and meeting people in Korean culture, drinking can become a difficult subject when it comes to idols and the entertainment industry. To humanize idols, some have gone on-camera intoxicated for promotional purposes. For example, the Wonder Girls performed their 2016 single, “Why So Lonely,” under the influence. Dingo has several other tipsy videos dating back only a year, starting with Roy Kim. It’s a rather new phenomenon and only five girl groups have featured out of about the 20 tipsy videos. In the video, Hyerim appears completely out of it. She’s at the point she’s barely audible and barely participates. Sunmi is on the same planet as Hyerim. She flails around unconventionally to the music as Yubin and Yeeun carry the song. The video was seen as cute by much of the commenters on the video — and it is hard to deny the cuteness of a drunk Sunmi. Part of the acceptance of their inebriation might lie in the Wonder Girls’ legacy throughout the years. It also gave the fans a chance to see the girls perform in a completely new setting. In this case, it was in a warm environment with a recognizable brand of soju and the women obviously have their guard down. It wasn’t something fans got a chance to see on a daily basis, and for many groups, fans never get to see their idols with their guards let down like this. Idols publicly flaunting alcohol consumption is sort of a new trend, and the introduction of the show Drinking Solo is an example of that. Drinking alone is becoming a more common trend in South Korea — especially among twenty somethings. The Chosun Ilbo reported in January 2017 that about 2 of 3 people drank alone in the past year. Drinking Solo plays into that trend, depicting people drinking alone for various reasons. But this doesn’t just relate to idols on the screen, some idols have picked up solo drinking off the set. Jung Chaeyeon of DIA recently revealed that she enjoys drinking alone because none of the other DIA members enjoy drinking. During appearances on the shows Life Bar and Hello Counselor, Chaeyeon admitted to her frequent drinking while alone. Even her roommate Huihyeon chimed in during Hello Counselor: “I room with her and whenever I enter the room she’s fast asleep. I’ll usually find soju bottles rolling around next to her bed,” the DIA member said about Chaeyeon. Chaeyeon further admitted on beauty program Follow Me 8 that her beauty routine consists of a half-bottle of soju before bed. She believes it reduces swelling in her face. Drinking alone seems to be accepted for some idols, for example, it makes Chaeyeon cute, that must be why she has such a pretty face all the time. It might also be part of a revealing trend from the past year among alcohol and idols. Some female idols earn good publicity for their drinking habits, while others face vitriol when their intoxication becomes public. Many female idols have faced controversy when drinking alone. Most people know that idols drink outside of their time on camera, but it’s only a problem when exposed — at least for female idols. In fact, it seems that some fans believe female idols shouldn’t be caught drinking or consuming alcohol unless they are able to control the narrative. 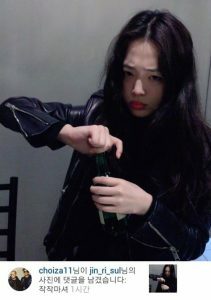 This is especially prominent in the webspolision over former f(x) member Sulli posting a picture of her obviously flushed with a bottle in one hand. Her boyfriend at the time, Choiza, commented on the photo saying, “Stop drinking.” Unfortunately, the photo and Instagram account have been deleted, but live on through the web. Sulli also faced controversy for being photographed while partying at a club. One commenter said, “On one side, I find it amazing and brave of her to be this open with her life and actions.. but I can’t help but also feel that this also cheapens her.” Others likened her to Lindsay Lohan, the American actress who ruined herself from frequent substance abuse. The biggest drinking controversy might have come in 2013 with Yoona and Taeyeon from Girls’ Generation. A video surfaced, reportedly showing them in a trashy back alley in China. The leaked, blurry photos and CCTV footage seemed to show Yoona and Taeyeon struggling around a trash pile, but the photos were grainy and their faces weren’t shown. Their agency, SM Entertainment, even denied the allegations. It turned out that the two women were likely friends of Tyler Kwon and not actually the Girls’ Generation members, but the damage was done for both singers. The false controversy still follows the two members whenever someone feels the need to pick a bone with Girls’ Generation. Where female idols seem to fall into one of two categories when drinking, the male idol drinking experience and portrayal is a little different. The culture of drinking among males is accepted and often celebrated, as we can see when it’s on display in Psy‘s “Hangover” with American rapper, Snoop Dogg. The way female and male idols interact with alcohol can paint the elements of a patriarchal history in South Korea. Searching through the Entertainment section of Naver or Nate for “party,” “partying,” and “drink” brings up very few hits of male controversies. In fact, the biggest one seems to be of actor Im Changjung. His “crime”? His then-pregnant wife picked him up from the bar. Female idols post on Instagram while intoxicated and face backlash; on the contrary, male idols generally only face controversy when they’re doing something as life-threatening as drunk driving like Super Junior’s Kangin and Lee Seung Chul. The influence drinking has on Korean culture and entertainment is undoubted. It’s okay for female idols to talk about themselves drinking in the comfort of their rooms; it’s acceptable and cute to use soju as a beauty product. It’s especially okay for females to advertise alcohol to a primarily older, male market. Female idols, in fact, make up the bulk of soju advertisements. IU, the most notable, has advertised for soju brand Chamisul for years. It was figure skater, Kim Yoona‘s advertisements for Hite that finally prompted the South Korean government to step in in an attempt outlaw celebrities under the age of 24 from advertising alcohol in the media; not because of the overly sexualized nature of the advertisements, but because they gave the impression it was cool for young people — especially young women — to drink. There is a clear double standard in how women and men are able to interact in the public spotlight when alcohol is involved. Women are expected to behave a certain way, and for young, female idols, those expectations include endorsing alcohol, but not publicly consuming it. These spokesmodel idols are portrayed as pure and something to strive for, and alcohol consumption doesn’t fit in that equation. Instead, they are asked to hold up the bottles and look enticing, while the men handle the actual drinking. Despite the changing tides with broadcasts like Dingo’s drunk performance videos, chaos still follows a female idol if they’re discovered in the public eye holding a bottle of soju out of their own volition. Sadly, these idols are just people trying to live their life and blow off stress. However, there will always be people looking to create controversy out of idols having fun.